Comes round a certain time where I have to pick my song for you in this little segment and I was still shell shocked of how good Whiplash was. The film has heavily influenced my choice and I'll be dipping my toe in track that isn't an actual OP/ED! How did Whiplash influence my choice? Well it's about a character in a jazz studio band. 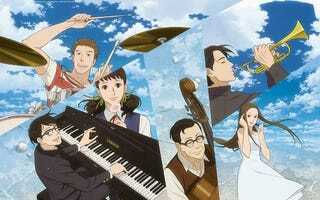 Jazz is a genre of music; there has been usage of jazz in anime which then leads me to a rather wonderfully quaint anime known as Kids on the Slope. Enjoy. Holy crap that was beautiful. Everything about this medley is just breath catching. You more or less imitate the audience in the very scene. At first you gasp, and then you forget to breath and become inanimate due to budget restraints! Stand there and gawk in awe, because this is THE moment in the show narratively. Which I won't spoil but this clip more or less does it. So you know what ever. So let's get down to it on a raw audio sense. Medley between lots of awesome songs from "My favourite things" to "Moanin'" Visually we've got an exceptionally authentic musical performance in the sense of motion and flow through the animation. It's so rare these days to be captured by a "live" musical performance in anime due to how difficult it really is sometimes to animate a musician. We've got the greats in the shape of K-on! And that one scene in Haruhi Suzumiya, and this sits along those other two. Cinematography wise, there was an interesting thing that I picked up which is obviously too obscure, but hear me out. At this stage of the anime, everything falls apart for our characters. There's this fantastic symbolic view of Kaoru (Pianist) and Sentaro (Drummer) friendship at this stage, the drum set in the lime light while the piano kept in the dark, this idea of Kaoru being casted aside into the darkness, out of Sentaro mind. As Sentaro performance was cut short, it's like the universe trying to reject Sentaro out of this band, even if he's just being nice to the other lads and steer Sentaro back with Kaoru. Back to this drum set in the light, and the piano in the dark, it's represent a strange Ying Yang kind of relationship. Kaoru classical musical background helps keep Sentaro musical flair in check, while Sentaro jazz influence helps shape Kaoru and bring him out of his rigid shell. It is through this they bring the best out of each other and bring the rest of the school to this utterly heart capturing moment. Also kind of sour that no one chose this moment in the Ani-TAY Podcast open topic, but luckily I've got us covered on this. Fun fact: Old Man Anime Fan was alive during the release of "Someday My Prince Will Come" on vinyl. He also auditioned for one of the dwarves but failed sadly for being too tall, though he won't disclose to Fruity which one he auditioned for.